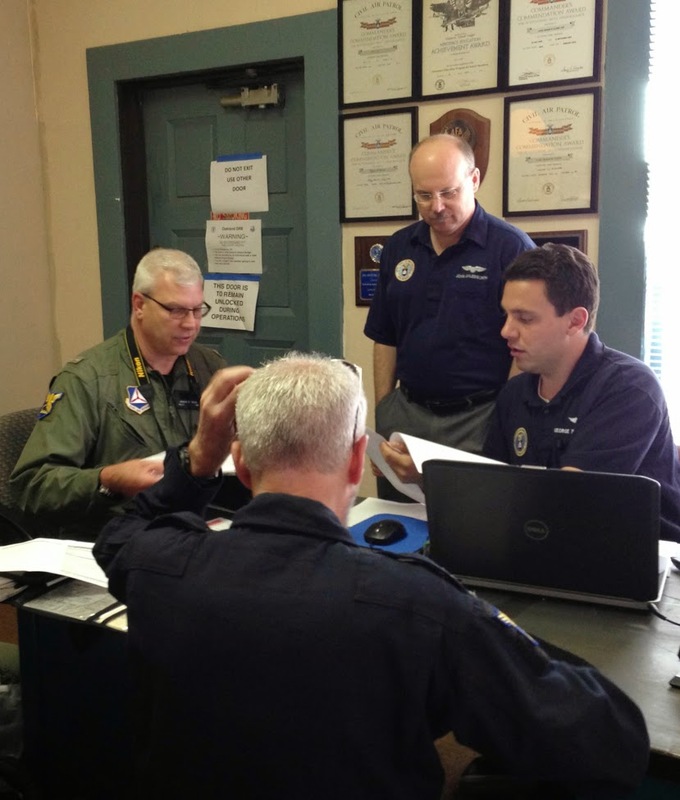 The California Wing (CAWG) of the Pacific Region Civil Air Patrol conducted a Disaster Relief Training Exercise (DRE) last weekend, 3 - 4 May 2014. Although this was not my first exercise participation in CAP, it was the first time I got a chance to see many of the different aspects of the exercise come together, in planning and in execution of the whole event. I came away really impressed with the thoughtful leadership demonstrated by those in charge of putting the event together – and heard a similar sentiment expressed by others participating throughout the weekend. My home squadron, Amelia Earhart, Senior Squadron 188 at the Oakland Airport North Field, hosted the exercise and participated as the mission base. 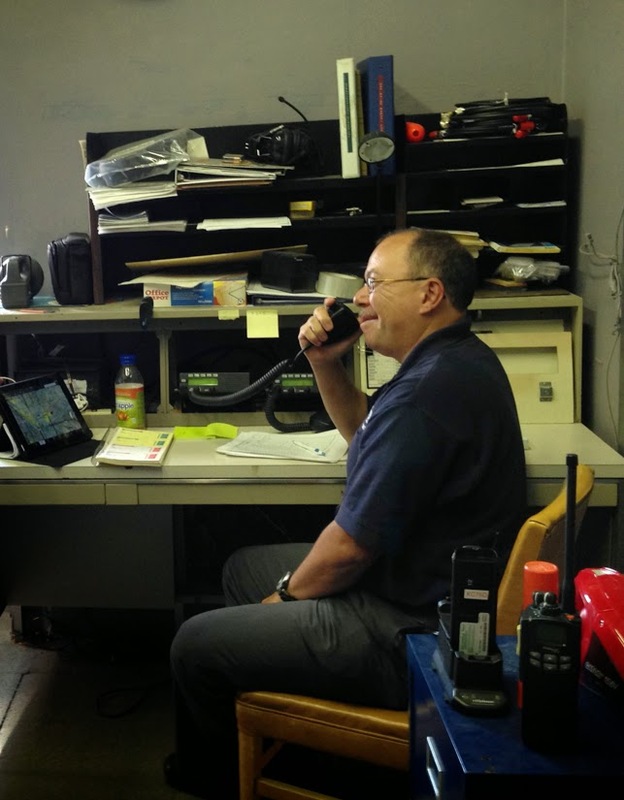 The purpose of the exercise was to enhance CAP’s operational readiness for providing support following future disasters, such as earthquakes and other events that may impact local/regional infrastructure of California. Over 50 CAP members from throughout California volunteered to make the weekend a success, with participation from 5 different San Francisco Bay Area squadrons (thank you to members from Palo Alto, San Jose – cadets and senior members, Concord and of course, Oakland), 3 squadrons from Central and Southern California (Bakersfield, Visalia and Santa Monica), and 4 squadrons from Northern California (Auburn, Redding, Sacramento and Santa Rosa). Training included CAP’s more traditional search and rescue missions using electronic and visual search techniques, both airborne and on the ground. 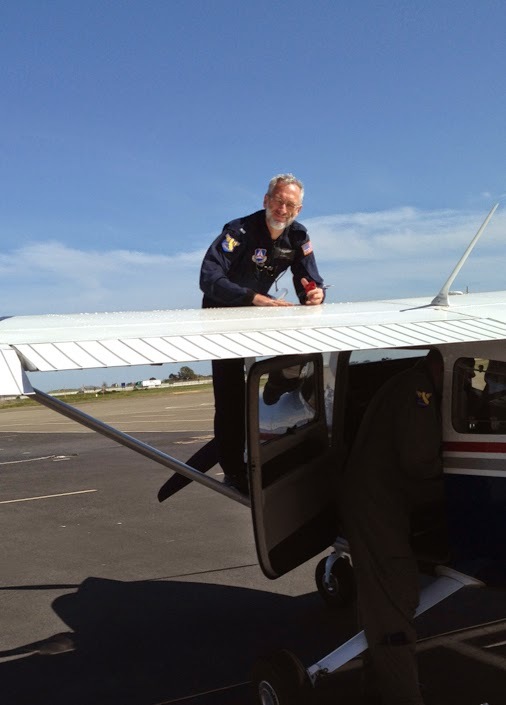 Thanks to outstanding training provided by base staff and air crew, I was able to achieve both a Mission Scanner (MS) rating (see Mission Scanner Ground School) and a Mission Radio Operator (MRO) rating, by applying my previously gained theoretical knowledge in actual flights (MS) and in supporting others' flights (MRO). 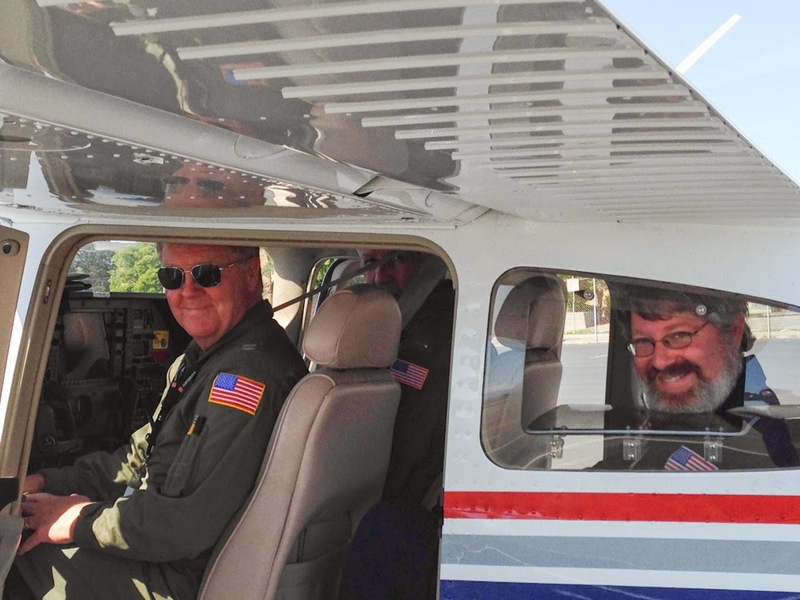 Gross (Mission Scanner, MS) are Ready to Fly! What was most fun for me was not just getting up in the air, but also seeing the whole thing coming together: I had previously seen some of the behind the scenes “sausage making” in the pre-planning efforts (thanks to 1Lt Jordan Hayes’ exceptional organizational and planning skills), and then saw it all in action: soaking up as much knowledge as possible as Mission Staff Assistant trainee; listening in on briefings about upcoming sorties; debriefing from what we just did; talking to the various teams on the ground and in the air while MRO trainee. 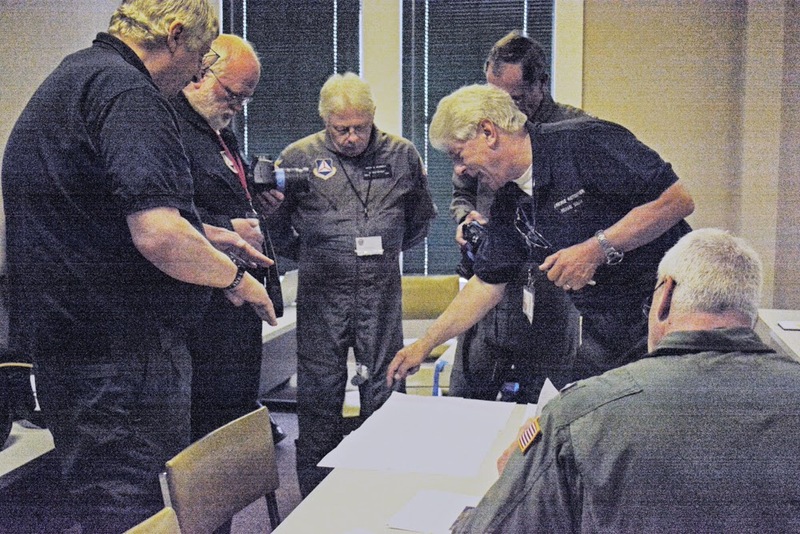 In keeping with CAWG’s new emphasis on disaster relief, the training also included aerial photography, with both ground-based and hands-on aerial exercises throughout the weekend. Disaster relief tasking was provided by FEMA and other agencies. The pictures that follow show some of the stages in planning and executing an airborne photography sortie. Do We Have Enough Fuel for the Flight? Mission Pilot 1Lt Stieber Wants to be Sure! Under the leadership of Lt Col Peterson, serving as Incident Commander, the entire weekend was concluded without any mishaps - without any real ones, that is; we did have a simulated missing aircraft, which kept us all on our toes until the aircraft was safely back in communications (and until we found out that this had been a simulation only!). 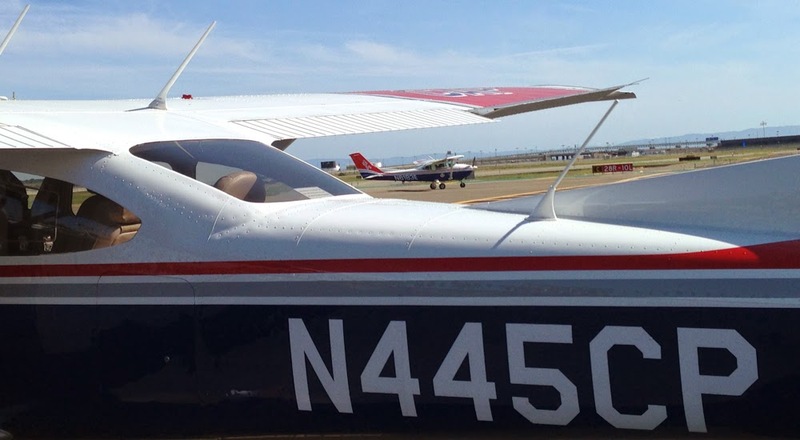 Besides being a lot of fun, the weekend was clearly a training success: Over 40 air and ground sorties were completed. 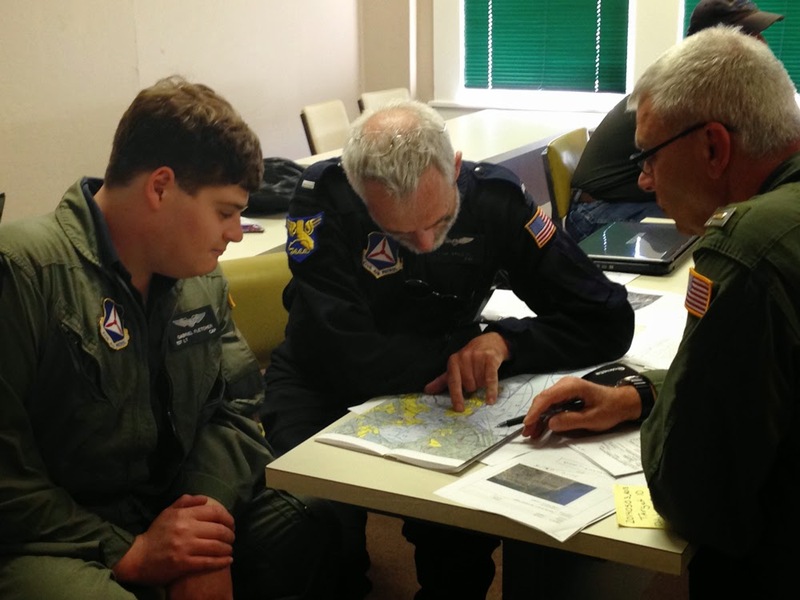 More than 20 new training ratings were achieved by air crew, base staff, and ground team members as a result of this exercise, thus enhancing CAP’s ability to safely and effectively carry out its search and rescue and disaster relief missions in support of our communities. Karin! you do a great job!